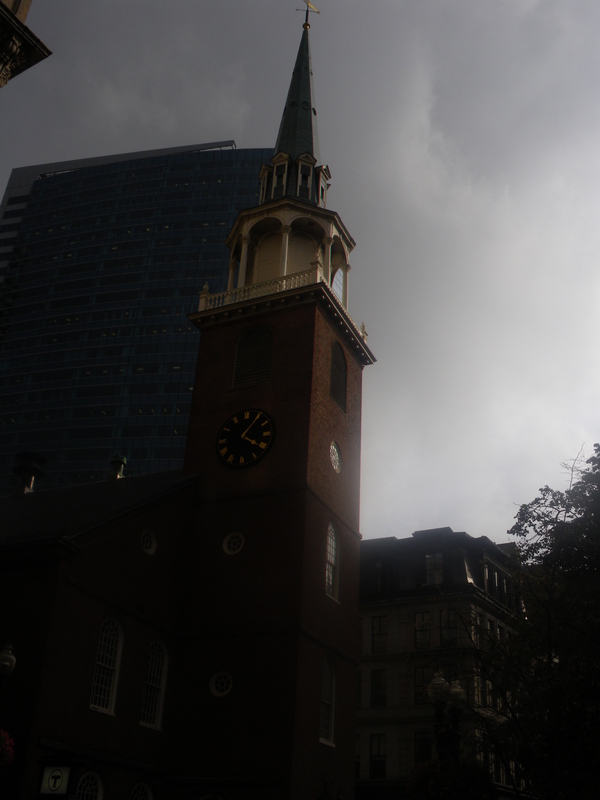 Back down from the top of Bunker Hill, I decide to wander a bit around Boston. There’s a good four hours left before I have to leave, so that’s plenty of time to see more of the town. 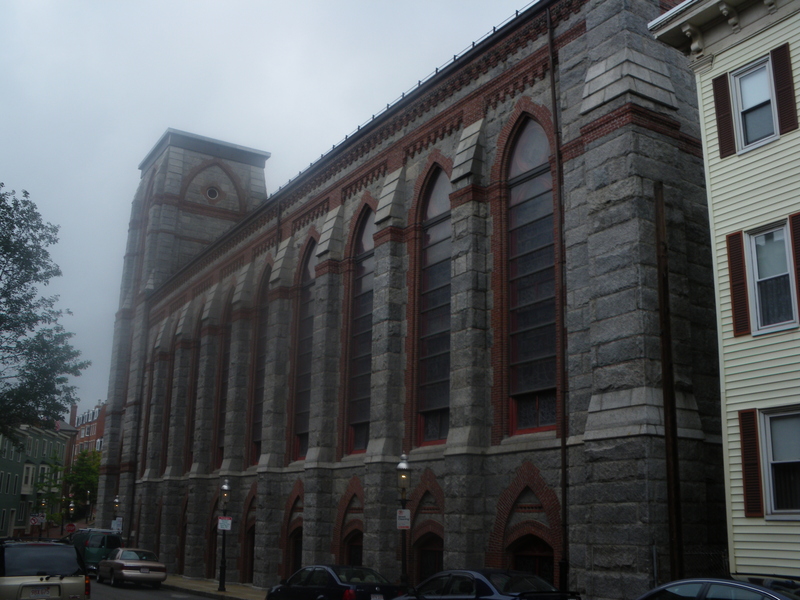 Just about the first thing I see, very close to the Bunker Hill monument, still on the north side of the Charles river, is one of the prettiest church I can think of in my life (at least, as far as it looks from the outside). It’S not that it has particularly impressive architecture, it’s just the way it’s built, mixing gray and red brick. There’s just something about that color mix that I really like. After some more wandering north of the river, through a park or two, and past many, many old buildings, I head back over the bridge toward the North End and the rest of Boston. I take my time; the bridge had some fantastic views on the harbor, all the small sailships, (and the one not-to-small sailship we discussed a year ago in the last installment). On the other side, I wander through another park, named for a Harvard athlete who was murdered in the 70s . At this point I’m starting to look around for a restaurant, but all I can seem to find are the pricey italian places which I can’t afford at this point. 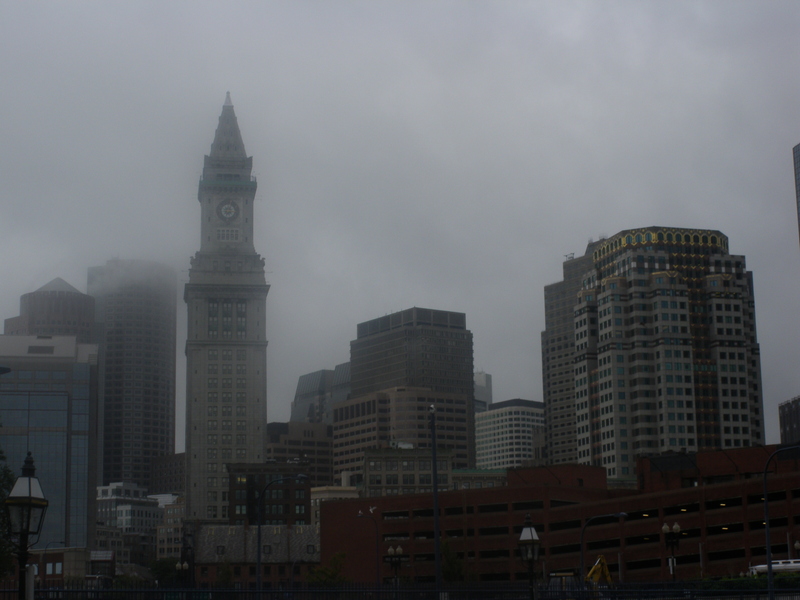 It’s still quite the gray day, but at least the clouds aren’t quite so low anymore (otherwise the trip up the Bunker Hill monument would have been, ah, interesting). It’s at the very least getting easier to see the buildings of downtown Boston. See? Now we can see them. Kind of. I end up getting lunch from one of the many restaurants at Quincy Market. A greek burger (burger with feta and black olives), but this one’s nowhere near as good as the ones I’ve had at the Fox and Feather in Ottawa). And then, out of nowhere, that’s when the sky finally decide to behave itself, and the sum starts coming up. With suitably dramatic lighting effects, of course. You’re silly, sky. Most of the rest of the afternoon is spent wandering around Boston, taking advantage of the break in the weather. The light contrast did a pretty good job of helping me to the realization that I really wanted a HDR camera. (And now I finally have one, but that’s a story for another time). There’s many things I could show pictures of at this point, but not that much to tell about them. There is another cemetery (with a monument to Ben Franklin’s parents), a curious church that look very little like the churches I’m used to (Tremont Temple, a Baptist church). By that time, the clouds are pretty much all gone, and I end up spending a good little while by the seashore in the harbor. The harbor. Clouds are gone. …not that it lasts very long. 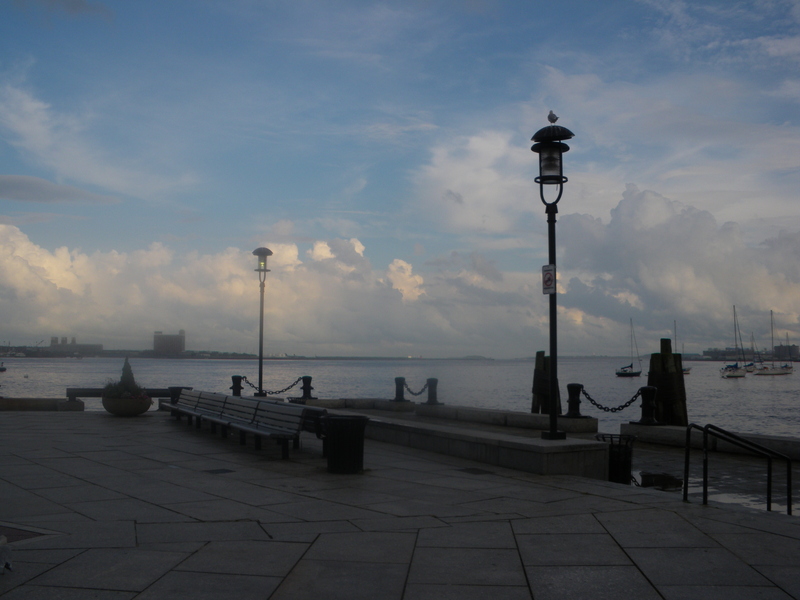 By the time I leave that pier, and start slowly heading back down toward the Commons and/or the bus station, the clouds are back again, doing that dramatic lighting thing of theirs on the skyscrappers of downtown Boston. Then by the time I get to the old state house, they’re gone again.. 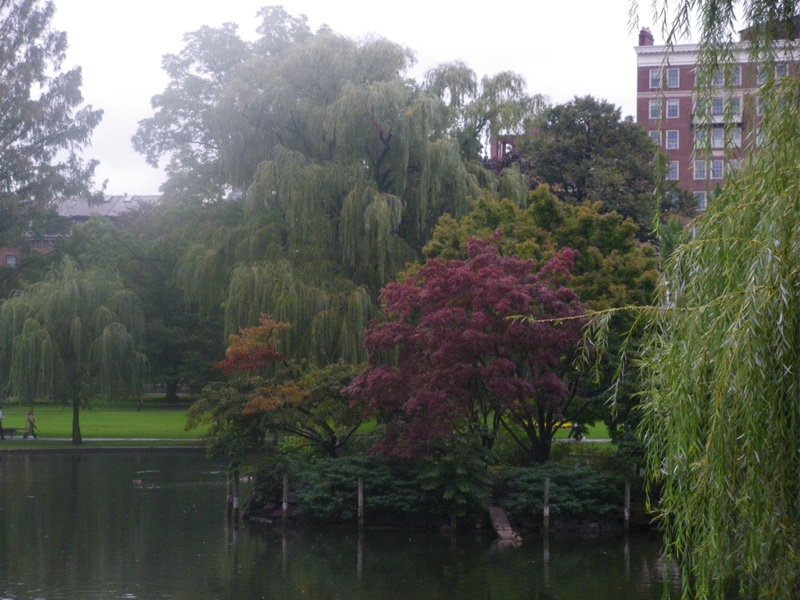 I end up wandering my way back to the vicinity of the Boston Commons, and specifically the nearby public gardens, and staying there until it’s time to board the bus again to get to Brunswick. It’s not long after that before I have to take the bus again. Sadly for another night ride, where very little can be seen, to Brunswick, in Maine. It’s nearly three hours to get there, and, by the time I’m settled in at the hotel and getting hungry, of course all the food places are closed, even the McDonald. …all except one. Fortunately, Canada comes through for me, and, just around when I’m about to give up, I spot in the distance a sign that says “Tim Hortons – 24 hours”. And that’s just as good a place as any to end this episode of the adventure.